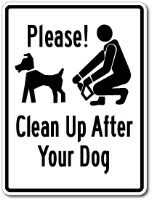 Pet signs are a friendly reminder and great way for informing and directing the viewer with the information you wish to convey such as No Pooping Signs, No Dogs Allowed Signs, Designated Pet Area Signs, Dog Park Signs, No Dog Signs and more. Heavy Duty .080 Aluminum for pole mounting or Standard Duty .040 Sign for fence or wall mounting. All signs come with Standard 3/8" Mounting Holes centered Top and Bottom. Most signs are available in your choice of RED, BLUE, BLACK or GREEN on white background. 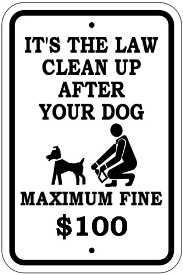 You also have option to add a reflective background to your sign. 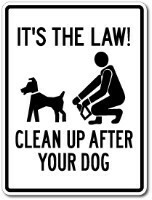 18" x 12" Please Clean Up After Your Dog It's The Law!